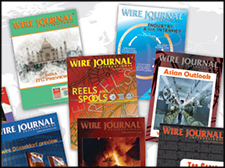 The Wire Journal International is the official publication of the Wire Association International. It is available in print and digital format. Additional WAI publications are listed below. The WJI Reference Guide is updated and published annually. The publication is an international industry buyer's guide and a directory of WAI members. The WJI Reference Guide lists contact information for international manufacturers and suppliers to the wire and cable industry. Company listings include more than 1,100 product types. The Official Show Program is distributed to the attendees at WAI’s Annual Conventions and exhibitions. Visitors reference the publication for exhibit information, technical program, plant tour, and other activity schedules. Display advertising and exhibit descriptions are accepted in each issue. This tabloid-size news medium covers Asia's growing wire and cable sector. It includes industry news, interviews, case studies, technical articles and more. It is published quarterly in India.